Azalea Estates Executive Assistant Dionne Ryff and Community Relations Director Mirna Coeur are pictured here with Joe and another favorite Super Resident, Wilda Childres. Once upon a time, young Joe Estes loved to read comic books. Now, almost a century later, he gets to bring the comics to life to entertain local kids and families as one of the world’s best-known superheroes: Superman. 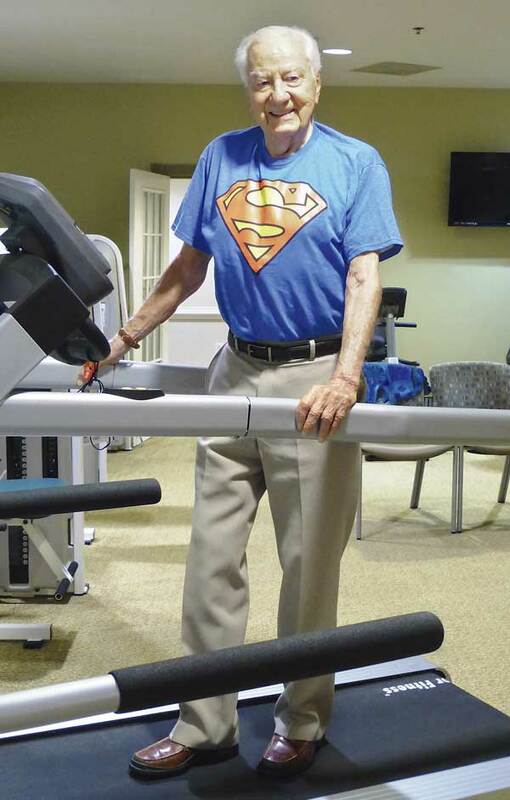 Joe, age 97, is part of Azalea Estates of Fayetteville’s superheroes group, which makes appearances at local festivals and events, signing autographs, taking pictures, and showing people that age is no barrier to adventure. 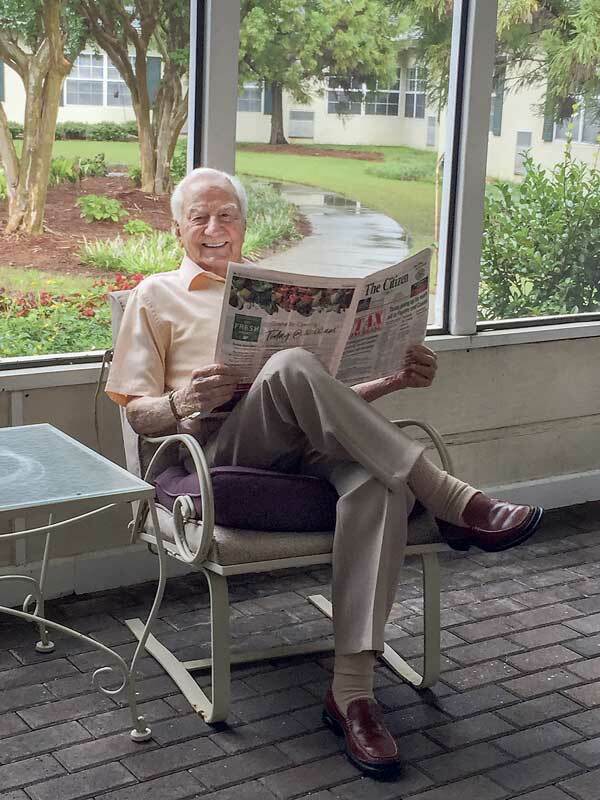 Joe Estes shows the world that you are never too old to stay active. In reality, Joe has had a pretty super life. He was born and raised nearby and graduated from Luthersville High in 1937. He then started work as a messenger for Southern Railway Co., making 30 cents an hour. He earned several promotions over the next five years, and when he left to join the Navy in 1942, he was a Rate Clerk earning a whopping $6.24 a day. He served in the Naval Air Corps for 38 months, during which he was stationed at six locations across the country. While in Rhode Island, he met his wife, Frances, whom he married after just six months, and the couple had 66 great years together. Returning to Atlanta with his new bride after the war, Joe discovered that his old employer, Southern Railway, had a job ready and waiting for him. He took advantage of the GI Bill to attend Georgia Tach, then Atlanta Law School, graduating with a master’s in law five years later. Meanwhile, he and Frances had three children and, when he wasn’t busy with work or school, he raised beef cattle on the 135-acre farm the couple purchased in Fayette County. After college, Joe received offers to work for the FBI, a major downtown law firm, and Southern Railway. He chose the railway, and eventually became the head of their legal department in Norfolk, Va. For thirty years, he handled personal injury and property damage claims, representing the railway in and out of court. In 1985, he retired and he and Frances returned to Fayetteville to be near their daughter and grandkids. A year later, the daughter and family moved, but Joe and Frances knew they were home. They loved the convenience of and environment in Fayette and decided they wanted to live out their days here. Joe checking out the latest copy of The Citizen. In 2011, the couple moved to Azalea Estates, which appealed to them because of its private-apartment setup and also because of the activities and services available. They also had friends at the community because Gideon International used to hold monthly meetings there and Joe has been a long-time member. After Frances passed the next year, Joe became even more involved in community life. 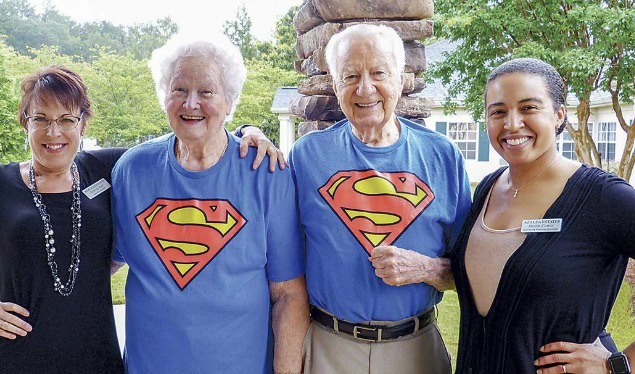 He became the Azalea Estates Superman when the superheroes program launched in 2016 and says it’s been a great adventure.